It’s time for another lesson in morphology with the return of the Power Rangers to the big screen. In the seaside town of Angel Grove, teenagers Jason (Montgomery), Kimberly (Scott), Billy (Cyler), Zack (Lin) and Trini (Becky G) are working through their issues. By happenstance, they find themselves at the same quarry outside Angel Grove at the same time. This is the resting place of a long-buried alien spacecraft. They find themselves possessing superpowers, and upon exploring further, enter the alien ship. There, they meet the robot assistant Alpha 5 (Hader) and Zordon (Cranston), a former Power Ranger whose consciousness is trapped in the walls of the ship. Zordon charges Jason, Kimberly, Billy, Zack and Trini with the responsibility of becoming a new team of Power Rangers. They must train their minds and bodies, and master control of bio-mechanical robot vehicles called Zords. This is so they can face the evil alien witch Rita Repulsa (Banks), who has awakened to wreak havoc after a millennia-long slumber. Nostalgia being the booming business it is now, it was only a matter of time before a big-budget movie reboot of Power Rangers came to fruition. Mighty Morphin’ Power Rangers, an American adaptation of the Japanese tokusatsu franchise Super Sentai, first aired in 1993. The kids who watched it then have spending power now, and some have kids of their own. We would caution against taking younger ones (under nine or thereabouts) to see this, since there are certain scenes that children could find genuinely unsettling, and because there are sexual overtones during one intense fight. One of the biggest challenges facing director Dean Israelite is tone. The cheesiness of the TV show, which recycled footage from its Japanese progenitor, is a big part of its charm. However, a contemporary Power Rangers movie must stand toe-to-toe with polished, expensive products such as the Marvel Cinematic Universe movies. Surprisingly, Power Rangers strikes an adequate balance – for the most part. We do get a discernible Young Adult (YA) fiction vibe, and there is some moodiness – as can be expected from teenage characters. However, the film doesn’t take itself too seriously. For example, there’s a scene in which Zack’s Zord narrowly avoids an actual bus full of nuns. There’s also a running gag/spot of product placement involving a donut chain. Much of Power Rangers unfolds predictably, doing the same old origin story song-and-dance. There is a training montage or two, and it’s almost 90 minutes into the film before our quintet of heroes dons their full armour. However, we do appreciate the palpable effort in getting some character development in. Instead of a breathless string of action sequences, audiences get to know each of the five characters enough before they’re plunged into battle. Some emotional moments are awkwardly written and performed, but scenes like a fireside gathering during which the characters try to get to know each other better feel welcome in a sci-fi action blockbuster. Much has been made of the designs, with some long-time fans being sharply against the reimagined looks. Production designer Andrew Menzies rationalises the drastic aesthetic updates as emphasising the alien nature of the technology. The underlying concept makes sense, even if the suits end up being a little too busy. When they’re in the thick of the action, it’s sometimes hard to discern which prehistoric creatures each Zord is based on. However, compared to the designs in the live-action Transformers movies, this is an exercise in minimalism. And unlike the character designs in the Teenage Mutant Ninja Turtle reboot films, they’re not viscerally off-putting to look at. Weta Workshop and Legacy Effects worked on the physical suits, which are worlds away from the traditional spandex look. The visual effects work by vendors Digital Domain, Image Engine, Method Studios, Pixomondo and Scanline is uniformly impressive. Whether one finds the main characters annoying will depend on one’s tolerance of millennials. There are moments when Power Rangers tries too hard to be hip and cool, but Israelite and his writers are trying to develop the characters beyond the archetypes they embody. Australian actor Montgomery, who resembles the love child of Rob Lowe and Zac Efron, is a serviceable ‘boring’ team leader. Cyler is sweet and endearing if a tad grating as Billy, who is on the autism spectrum, putting a few too many tics into his performance. Scott’s Kimberly, a cheerleader rebelling against perfection, will make some eyes roll. Lin is pretty fun as the most free-spirited and impulsive member of the team, who’s hiding a vulnerable side. Singer Becky G cranks up the attitude as the sullen, hoodie-clad Trini. It’s possible that this bunch could develop compelling chemistry after a sequel or two. Cranston is an excellent choice to play the wise mentor, and Power Rangers augments that character type slightly by giving Zordon possibly selfish motivations. Zordon is portrayed via computer-generated pinscreen animation (think the Kryptonian displays in Man of Steel), so some of Cranston’s facial expressions are retained in the performance. Banks is, naturally, the best part of the whole thing. She’s a pitch-perfect Rita Repulsa, fully aware of the type of role she’s playing. While she fulfils the cackling, scenery-chewing quotient long associated with the character, there are moments when Banks is genuinely frightening. The make-up effects, supervised by Supernatural make-up effects artist Toby Lindala, are suitably creepy. As with any reboot of an established franchise, some fans will detest certain changes made in Power Rangers. However, thanks to its surprising emphasis on character development and rock-solid production values, this is a worthy – if far from perfect – reboot. Studio Lionsgate are hoping for at least six films, which might be a touch optimistic, but we can see this going somewhere. Look out for a cameo from original stars Amy Jo Johnson and Jason David Frank, and stick around for a mid-credits scene teasing the addition of a popular character. 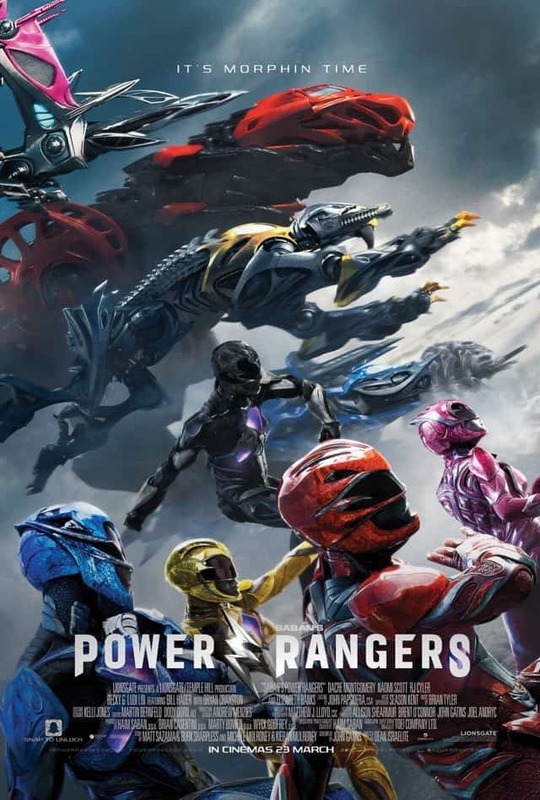 SUMMARY: Power Rangers’ updating of the beloved TV show is not a seamless one, but it works more than it doesn’t, serving as an efficient set-up for the mythos of this reboot. It’s also just edgy enough without being ridiculously mopey.